3 x 5 Rolled Blank Scroll | Blank Scrolls | Scrolls Unlimited, Inc. 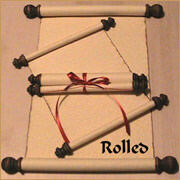 These scrolls are made just like the 2 1/2 x 4 scroll - just a little bigger. Present the scroll in our little organza bags available in a variety of colors. Quantity discounts are available for 25 or more. Choose up to 2 colors of ribbon - especially if you have a two-color theme.